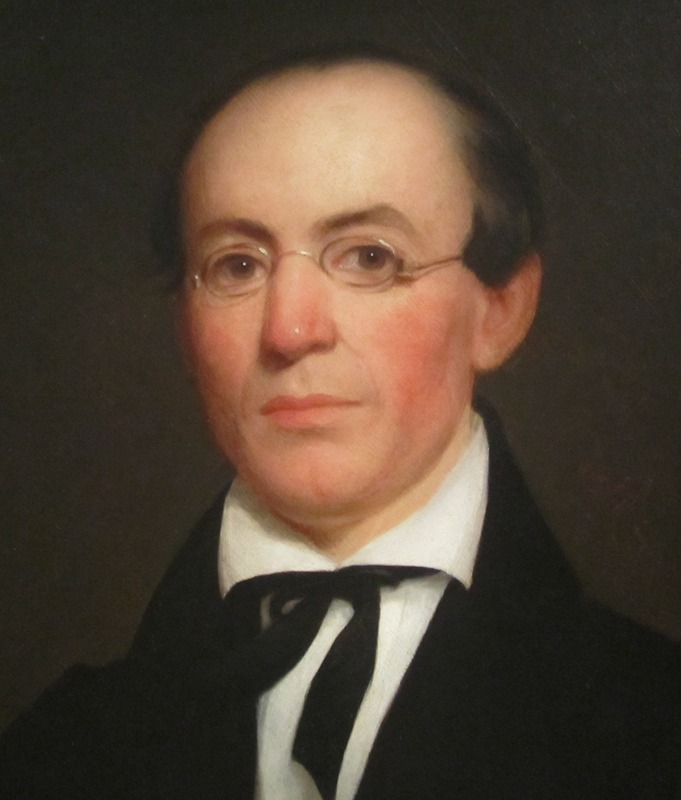 William Lloyd Garrison (1805-1879) in 1833. I’ve been meaning for some time to write an article or two on William Lloyd Garrison. Today being his birthday, I figure it’s a good time to get around to that. Garrison, Boston’s leading abolitionist, influenced the political and social course of our nation in profound ways. In doing so, he played no small role in the coming of the Civil War. I feel he was one of the bravest historical figures I know, unflinching in his principles even in the face of lynch mobs. As I see it, the moment that launched Garrison irrevocably on the course of moral revolution was July 4, 1829 as he stood up to address roughly 1,500 people in Boston’s Park Street Church. At age 23, it was his first significant public address. And it was a barn-burner. A bit of background first. The young, aspiring journalist and activist who was to make that address was born in Newburyport, Massachusetts in 1805. His father had been a sea captain who fell on hard times and deserted his family in 1808 during Jefferson’s Embargo. Garrison’s mother was a strong woman of powerful religious conviction and was determined to support her family by becoming a nurse. In 1818, Ephraim W. Allen, proprietor of the Newburyport Herald, accepted Garrison, then 13 years of age, as an apprentice and taught him the printer’s trade. By age 16, Garrison was writing columns for the Herald under various pseudonyms. In 1826, Garrison became editor of The Free Press, another Newburyport newspaper. The paper did not last long. But it had some claim to fame in that Garrison therein published the first printed verses of poet John Greenleaf Whittier. Garrison and Whittier would develop a lasting friendship. In 1828, Garrison went to work in Boston as editor of The National Philanthropist, a paper launched by a Baptist minister, Rev. William Collier, devoted to the “suppression of intemperance and kindred vices.” Garrison’s outspoken support of social reform efforts attracted the attention of antislavery activist Benjamin Lundy (1789-1839), a New Jersey born Quaker who, in 1821, had commenced publishing the nation’s first antislavery newspaper, the Genius of Universal Emancipation. As Lundy traveled about quite a bit on lecture tours, the paper was published during the 1820s out of any available office he could find in many different states. Lundy came to Boston on a lecture tour in 1828 and immediately struck up a strong friendship with young Garrison. They discussed ideas for the establishment of an antislavery society in Boston. Lundy urged Garrison to work with him on his paper. Excited at the prospect, Garrison resigned from the Philanthropist. But Lundy continued on his lecture tour and their collaboration would be delayed for some time. Finding himself without means, Garrison was recruited to become editor of a political propagandist paper in Bennington, Vermont, conceived and backed by anti-Jackson men in that town. It was less than ideal, but the backers gave Garrison latitude to publish articles on reform movements…particularly antislavery. His few months of work with the Bennington paper once again brought Benjamin Lundy around. The peregrinating abolitionist appeared in Bennington and suggested that Garrison come to Baltimore where Lundy intended to resume publishing his paper. Garrison agreed and on his way to Baltimore, he stopped in Boston during the summer of 1829. He shared a room with his friend, the poet Whittier. 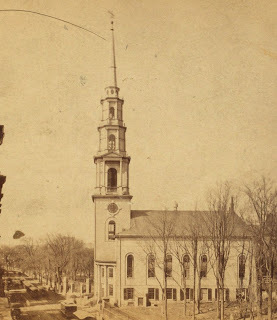 Boston’s Park Street Church had begun a tradition of Fourth of July lectures some years earlier. Many members of the church were devotees of the American Colonization Society. “Colonization” was an early and rather flawed form of antislavery that advocated gradual emancipation and deportation of freed slaves to colonies in Africa. The Fourth of July lectures at Park Street Church raised funds for missions in these African colonies. The church booked Garrison, at that time a rather unknown but intriguing young journalist, to give the annual lecture. The moment came for his address. He had titled it, “Dangers to the Nation.” I offer some condensed highlights (and the reader will please pardon the “sound bytes.” A more complete text can be found here). I speak not as a partisan or an opponent of any man or measures, when I say, that our politics are rotten to the core. There is an evil…It should make this a day of fasting and prayer, not of boisterous merriment and idle pageantry—a day of great lamentation, not of congratulatory joy. It should spike every cannon, and haul down every banner. That the slaves of this country, whether we consider their moral, intellectual or social conditions, are preeminently entitled to the prayers, and sympathies, and charities, of the American people. That, as the free States—by which I mean non-slave-holding States—are constitutionally involved in the guilt of slavery… and it is their duty to assist in its overthrow. That no justificative plea for the perpetuity of slavery can be found in the condition of its victims; and no barrier against our righteous interference. This was not the lecture the audience was expecting. I am sure there was great shock and surprise. Garrison, at age 23, had voiced revolutionary views that would define his life’s work. Emancipation must be achieved through moral suasion, through prayer, churches and charity…not politics. Free states must shed their apathy and work to overthrow slavery. Freed slaves deserved full, equal rights as citizens. And if this was not accomplished, terrible bloodshed, either through Civil War or massive slave revolt, would result.